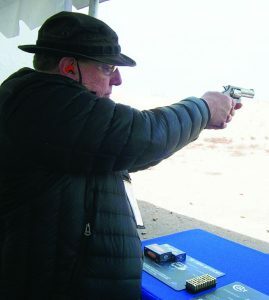 Author shooting the Colt Cobra .357 at Media Day. 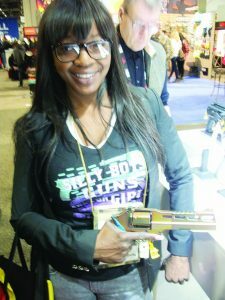 The 41st Annual SHOT Show got under way Jan. 22 to 25, 2019 at the Sands Convention Center in Las Vegas, NV, and offered a look at the latest developments in the gun, ammunition and outdoor industry. Things actually began for me on Monday, Jan. 19th with Industry Day at the Range. That event is open only to industry professionals and the media. Bright and early a caravan of buses left the Sands Convention Center for the Boulder Rifle and Pistol Club near Boulder City, NV. The major gun companies had shooting booths set up that extended up and down the expansive facility. The crack of gunfire was audible as we got off the buses, checked in, received our complimentary eye and ear protection, and proceeded into the range area, offering shooting booths that stretched the distance of a several football fields. Mantis has new electronic programs for monitoring a shooter’s progress. A big guy dressed in a Bigfoot costume welcomed everyone as we walked inside. I immediately went to the products section for some prearranged appointments, but was sidetracked by one booth featuring a submachine gun. The company, ST Engineering, is based in Singapore and the booth’s two occupants were eager to show off their latest guns. From there I met with my friends from Mantis (mantisx.com), who specialize in using the latest computer technology to improve shooting techniques. 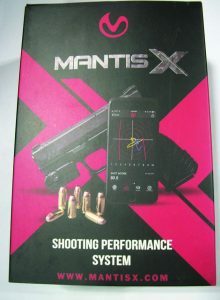 On display was the new Mantis X 3 monitoring device (MSRP $169) that attaches onto the rails of your pistol and sends back an analysis of the shooting technique to the shooter’s smart phone or tablet. The company is offering some enhancements to the device this year, including a quick release lever to remove the device, and a new version, the X-7(MSRP $199), which can be attached to a shotgun to offer the same high tech shooting analysis. The .50 cal. Cell Phone gun. Next I stopped by DECIBULLZ booth (decibullz.com) to get some custom fitted earplugs. The plug is made of a special plastic that is made malleable after being placed in 160 degree water. The plug is then placed in your ear after cooling off a bit, and it forms a seal based on the contours of your inner ear canal. Once hardened, it provides some excellent ear protection. Also on display was American’s series of medical trauma kits. 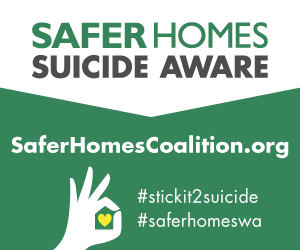 The kits have several models that can be useful to law enforcement, hunters and campers, or for home first aid. I then visited the ASP tent and got a firsthand look at their new, lightweight aluminum batons and their enhanced handcuffs, which have a polymer covering between the cuffs to prevent the device from being defeated. 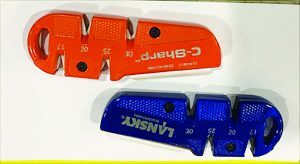 The two new pocket-sized knife sharpener from Lansky Sharpeners. I was anxious to get to the shooting, but Ring Power Tactical Solutions (Ringpower.com) once again had their Rook armored Vehicle on display and I was hoping to get a chance to drive it. It’s a unique piece of equipment that can be used as the ultimate breaching tool as well as a way to deploy personnel close to a situation while offering ballistic protection. It’s been on the television show, S.W.A.T, several times. Unfortunately, I never got close enough to sit in the driver’s seat. The temperature and strong wind proved to be challenging as well. I managed to fire a few guns at various booths, but not as many as I’d hoped. One I did like was the new Colt Cobra .357 revolver, which was released in .38 caliber last year. There’s nothing quite like firing a powerful revolver. I also fired the Elite, a spruced up version of the always dependable 1911 semi-auto design. By the time I got to it, the weapon was pretty dirty and jammed on the third shot. Luckily, with my extensive handgun training, clearing a malfunction of this sort was second nature. The range supervisor seemed surprised that I was able to accomplish this and fire off the rest of the magazine. He apologized for the jam, but I assured him that it must have been due to the overuse and left him with the task of cleaning it. Ironically, one of the other stops I’d made earlier was to Real Avid (realavid.com), which offers a variety of cleaning devices and brushes that could have made that task a lot easier. The show itself got off to a good start the next day at the Convention Center, which is a massive facility taking up two levels of over 16,000 exhibits as well as more attractions on the upper floors. 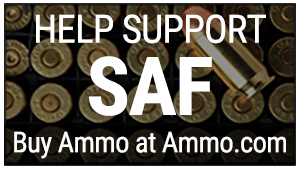 The NSSF (National Sports Shooting Federation) once again offered a special app you could put on your cell phone to help streamline your selections. There were numerous press conferences and seminars available, too, on a variety of subjects. One of them, in the Law Enforcement Education Program (LEEP) featured a session called Counter Ambush Care Under Fire, and spotlighted the use of unmanned aerial vehicles, or drones, in surveillance, tracking, and delivery of materials. These aircraft can be fitted with steerable lights and thermal cameras to assist in searches and pursuits of suspects. There were also plenty of celebrities on hand. Former SEAL Jonathan Gillion was signing copies of his book, Sheep No More, Dana Loesh spoke at the NRA booth on the right to bear arms, and also making the rounds was gun enthusiast, Lou “The Incredible Hulk” Ferrigno. As always, there were many expert shooters, like multi-medaled, six time Olympian Kim Rhode. Several of the exhibitors featured high quality shooting instruction segments from their booths on the floor. After stopping by the Second Amendment Foundation booth (saf.org) and chatting with President Joe Tartaro and his lovely daughter, Peggy, I began making the rounds. I had occasion to speak with Dr. Joe Alton, who was showing his collection of Doom and Bloom Medical trauma kits (store.doomandbloom.net). Dr. Alton, a surgeon, has several different models for various users ranging from law enforcement and military to civilians. Each item in the kit is labeled with the consecutive number that shows the order of usage, and an illustrated card explaining the numerical sequence is also included. 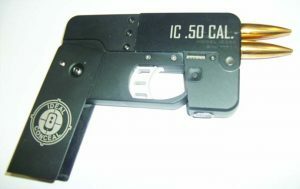 Minnesota based Ideal Conceal (cellphonepistol.com), which introduced their cell phone pistol at last year’s show, was present showing their latest advancements in their most concealable gun: a .50 caliber model and a clip-on holster that allows the weapon to be fired while still in the holster. I stopped next at PJL Targets (pjltargets.com), to visit retired Belgium police officer Francis Dorao. His impressive array of life-like illustrated targets provides “shoot-don’t shoot” decision-making training in a most economical way. Francis showed me one target featuring the artist’s rendition of his son, who is on the Belgium Police SWAT team. Francis mentioned that last year his son tactically neutralized the terrorist who had killed a police officer during a terrorist attack in their country. 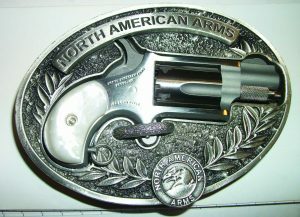 The belt-buckle mini revolver from North American Arms. Caracal Arms (caracalusa.com) was showing off its new Enhanced F model semi-auto pistol, a striker-fired 9mm semi-automatic, which is now manufactured in the USA. It’s “suppressor ready” in that it has a removable barrel thread protector to allow a silencer to be attached to the threaded end. The ergonomically designed grip makes it easy to hold, and reduces felt recoil (MSRP $460). No trip to the SHOT Show would be complete without visiting my friends at Lansky Sharpeners (lansky.com), which specializes in giving that extra-fine edge to your knives. They showed me their new diamond rod sharpener, which is part of their Master’s Edge set ($14.99). It sharpens any type of blade to perfection. They also had their new “Pocket Mini” knife available. At $3.99, it offers a small, razor-sharp locking blade that can be attached to your keychain, and their newest sharpener, the C-Sharp ($12.99), which offers a ceramic sharpener, with four sharpening angles, which polishes the blade as it sharpens. We next stopped at Chiappa Firearms (chiappafirearms.com) to see their new Charles Daly Honcho. This “sawed-off” triple barrel shotgun is available in various calibers ranging from 12-gaugedown to .410-bore, and works with just one trigger that needs to be pulled once for each of the three barrels. The wicked looking gun fires in a left to right sequence. It’s available as a standard pump, with or without a spring assist. Their .357 caliber Rhino Nebula is almost as mean looking. This massive revolver is offered in single action/double-action or single-action only. Rivaling the Rhino in intimidation is the Taurus “Judge,” the even more massive .50 and .410 caliber revolver The Taurus Arms (taurususa.com) representative said that these large frame guns have been growing in popularity the past few years. (“Big bore is all the rage.”) Noticeably missing this year was Taurus’s concealable novelty gun, The Curve. Apparently, this .380 tapered belly gun has been discontinued. 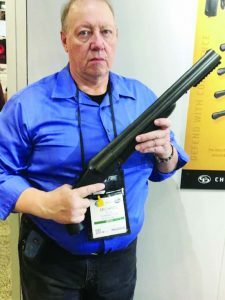 The author hefts the 3-barel Honcho shotgun from Charles Daley. Another big bore gun with a lot of punch but a more reasonable size is Magnum Research’s 429 Desert Eagle. This .50 cal. packs a wallop and is more ergonomically friendly than some of the other big boys. Sig Sauer (sigsauer.com) had their P365 on display, which now has a 12-round magazine available. It’s a smaller weapon that is ideal for concealed carry. I tried holding the gun while it contained both the 10-round and 12-round magazines. The 12-round version is a bit longer and allowed what I felt was a better grip for a shooter with large hands. Mossberg’s new MC1sc is their latest model to appeal to the concealed carry handgun market (Mossberg.com). The small polymer 9mm Luger semi-auto is striker-fired with a staggered-stack 6-round magazine. The pricing starts at around $425.00. Coast (coastportland.com), which specializes in knives and illumination devices (aka flashlights) was spotlighting their new DX357 knife. It has a black G10 handle with extra thick, heat-protected liners. A three-position clip on the handle allows for maximum comfort in placing the blade in your pants pocket, and the double-locking feature prevents the liner from accidentally slipping back into a closed position. They also showed me their FCDX-363, which they describe as an “all-muscle knife.” It has a steel, heat-treated handle for extra strength and is “super tough and rugged.” The FX-200 is their small, novelty knife designed for the person who likes to travel light. It has a sharp, locking blade, a money clip, and a bottle-opening feature. The SEAL 1 Complete Gun Care Kit (seal1.net) backed up its claim by displaying a gun completely immersed in a glass container of water, illustrating the moisture-resistant prowess of their lubricants. One of my more informative and interesting stops was at Viridian (viridianweapontech.com), which advertised numerous demonstrations of their new high definition weapon-mounted camera with audio. This magnet-activated camera is designed to begin recording when the gun is drawn from the holster. The angle provided is exactly what the person holding the gun sees, which is not always provided by a body-camera viewpoint. Since the recording time is much less than that of a body camera, many smaller and mid-sized departments find the video storage much more manageable because the camera only records when the gun is out of its holster. Viridian is the only company authorized to modify Safariland’s holster products to allow the camera to be attached to the weapon. In addition to their line of standard and compact design concealed carry holsters, Safariland (safariland.com)was spotlighting several new products, including the Vertical Universal Belt Loop (VUBL) for efficient holster height adjustment, the PROTECH Hi-Viz Shield which provides transparent view and eliminates blind spots, the Bianchi Prevader Concealment Holster which has a slim, low-profile design featuring Pinch retention in a multi-fit open-top holster, and their new Monadnock ExoTech Arm Protection Kit and Delta 4 Crowd Control Helmet Kit offering the latest cranial protection for first respondents involved in crowd management situations. Say hello to the .357 Rhino from Chiappa Arms. An Austrian company, Protectile (semex.co.at), had the latest innovative less lethal round on display. The yellow, polymer spheroid is about the size of a lemon and can be inserted into the barrel of a conventional pistol. No special ammunition is required. When the weapon is fired, the polymer sphere absorbs the round and travels on the same trajectory, delivering a blunted impact to the target. The force is comparable to a punch from a formidable heavyweight boxer. After firing this less lethal round, the gun can immediately be upgraded to its standard, deadly force capacity. Another spheroid can then be placed in the barrel, or the weapon can be used for a deadly force application. It allows for a quick and portable variance on the use of force continuum. Every year it seems like I’m seeing more and more women at the show, and catering to this growing distaff market is sensible business. Booths that specialize in concealed carry options for females like Gun TotenMamas (GunTotenMamas.com) and Can Can Concealment (CanCanConcealment.com) were perpetually crowded. They offer a variety of fashionable purses with sturdy, zippered pockets and also specially designed garments with sewn in holsters. With over 16,000 exhibits spread over 13 acres of floor space, it’s virtually impossible to see everything so you can believe I’m looking forward to next year. The 42nd SHOT Show will once again be at the Sands Convention Center in Las Vegas Jan. 21-24, 2020.